An SNP MP has been questioned by police over his financial dealings. 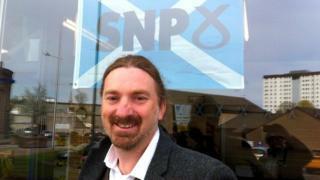 Officers interviewed Dundee West MP Chris Law after detaining him in the city on Wednesday. They are understood to be investigating Mr Law's Spirit of Independence referendum campaign, which he ran ahead of the 2014 vote. A source close to Mr Law said he was confident the matter would be resolved and that the MP has not been charged with any offence. The source told BBC Scotland: "Chris attended the police station on Wednesday morning and provided information in relation to a matter under investigation. He has agreed to provide the police with further information". First Minister Nicola Sturgeon told reporters at Holyrood that Mr Law would not be resigning the SNP whip over the issue, saying the MP was "confident he can resolve this matter". A spokesman for Police Scotland said: "A 46-year-old man was detained and has been released pending further inquiries. Investigations are continuing." The Spirit of Independence campaign saw Mr Law tour Scotland in a 1950s Green Goddess fire engine that had been painted in the colours of the saltire. Earlier this week, Glasgow East MP Natalie McGarry, who was elected as an SNP MP in May 2015, was charged in connection with allegations including embezzlement of funds, breach of trust and an offence under the Scottish Independence Referendum Act 2013. Prosecutors said they had now received a report from police into fraud allegations involving the MP. A Crown Office spokesman said: "The procurator fiscal has received a report concerning a 35-year-old female, in connection with alleged incidents said to have occurred between 26 March 2013 and 15 August 2016. Ms McGarry withdrew from the SNP whip when the allegations were made and has been sitting as an independent MP. Edinburgh West MP Michelle Thomson also withdrew from the SNP whip because of a police investigation into property deals by a solicitor struck off for misconduct, which are said to have involved her and the firm she was a partner at before she was elected to the House of Commons. The SNP is said to be giving "serious consideration" to a request to reinstate Ms Thomson. The police investigation into the solicitor's affairs is ongoing but party members believe Ms Thomson has been "denied natural justice" and that "her current situation has gone on for too long". The matter was referenced at Ms Sturgeon's weekly question session at Holyrood, with Tory MSP Murdo Fraser managing to raise it during a question about police budgets. He asked: "Given the number of the first minister's Westminster colleagues now helping the police with their inquiries, is the first minister confident that Police Scotland has the resources to deal with this upsurge in their workload?" 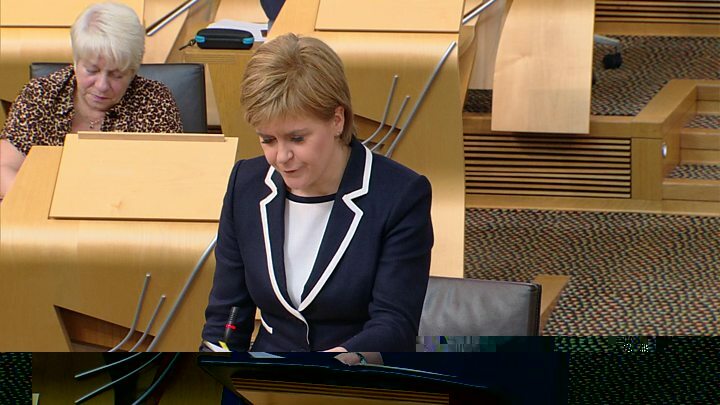 Ms Sturgeon replied that she had committed to real-terms protection of the police budget.